EDITOR’S NOTE (April 2018): Added some thoughts after a year of use. This spring, as I went to take stock of my outdoor tools, I noticed that my existing garden hose, which is several years old, was finally showing signs of wearing out. The hose had never been great — it was a bargain special from a local hardware store and kinked incessantly — but the appearance of white crease marks and the start of a tear convinced me that it was time to shop for a new one. Coincidentally enough, Aldi begins to parade out their home and garden Special Buys in the spring, many of them under their Gardenline label. And one of those Special Buys was a hose. All of this is, according to the packaging, backed by a lifetime warranty. Of note: the after sales support e-mail on the packaging lists the domain name for Bond Manufacturing, which creates gardening products for such companies as Stanley, Black and Decker, and Miracle-Gro. We’re not sure what that means for the quality of this hose, although a cursory glance at other Bond-made hoses seem to be reasonably good. Our preliminary tests were promising. It feels very sturdy, from the hose itself to the brass couplings. We tried it both uncoiled and coiled around a reel cart, and in both cases the hose stayed kink-free, even as we unspooled it. The coupling, likewise, made a tight seal to our cart reel (tighter than our older hose). After a year of use, those thoughts are still true … mostly. The hose itself still generally stays kink-free … except in some instances when it’s wrapped around our hose reel. The kinking happens at the coupling connecting the reel to the house, where the brass spring is. Unspooling the hose more usually solves the problem (as would connecting directly to the house rather than spooling it on a reel), but it does mean that the hose is a bit more finicky than we’d like on that one point. Finally, a warning: the packaging cautions that this hose contains chemicals such as lead is not safe for drinking. If you’re looking for a hose your kids will be drinking out of, you’ll probably want to search elsewhere. 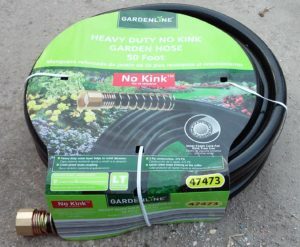 Gardenline Heavy Duty No Kink Garden Hose is a decent addition to the back yard. It’s not a commercial-grade hose, and it is not as kink free along the connector as we’d like, but for home use it fits the bill nicely. The $13 price tag and lifetime warranty are big pluses.